EDC Wholesale starts with the construction of a harbor in the A.G. Wildervanck canal on the Phoenixweg. 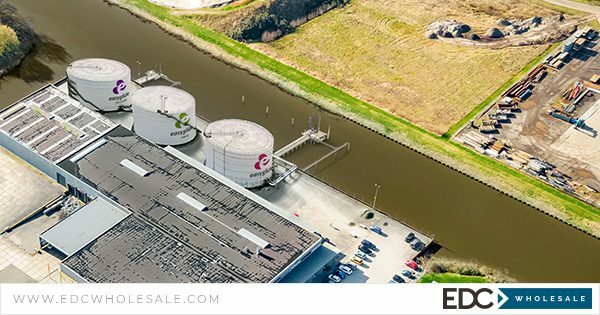 For faster shipping of large volumes of lubricant, the company places 3 silos on the canal behind the building, each with a capacity of 50,000 liters. To minimize transport costs and guarantee faster delivery to retailers, the company will start constructing the port and placing the 50,000 liter silos on its own site at the A.G. Wildervanck canal, where boats can moor to release the large quantities of lubricant directly into the silos. The company installs the silos to handle a larger stock of lubricant and to deliver orders faster. Keeping large volumes in stock is both efficient and cost-saving for the Veendam company. EDC Wholesale is located in Veendam, on the Phoenixweg where the canal connects to the river Ems. Transport via water is very efficient and cost-saving from the location of the company, which is located directly on the canal.